Jesus Christ (c. 4 BC – c. AD 30) was a spiritual Teacher, who preached a gospel of faith, love and forgiveness. His life and teachings led to the emergence of a new religion – Christianity, which became the dominant religious force in the western world. The Christian religion reveres Jesus Christ as the Son of God. Jesus is also an important prophet in Islam, and his teachings are widely admired by other religious traditions. Jesus was born in Bethlehem, Judea – then part of the Roman Empire, under the rule of Herod. Jesus was born into a Jewish family; his parents were Mary and Joseph of Nazareth. Jesus was born in Bethlehem because his father had to travel to his place of birth to take part in the Roman census. Because of over-crowding due to the census, the family were offered a place in a stable, and hence Jesus was born in the humblest of surroundings – in a manger surrounded by animals. According to the Gospels, the birth of Jesus was proclaimed to shepherds in nearby fields. Later on, Jesus was visited by three wise men from the east offering gifts of gold, frankincense and myrrh. Shortly after Jesus’ birth, Herod was told a ‘future king of the Jews’ had been born in his kingdom. Feeling his temporal power threatened, he ordered all young Jewish boys to be killed. The Gospels relate how Joseph was warned in a dream and, as a result, took his family to Egypt before returning to Nazareth when it was considered safe. Not much is known about Jesus’ early life, the Gospels concentrate on the last couple of years when he was active in his ministry. However, Jesus is believed to have followed in his father’s footsteps and trained to be a carpenter. Some have also suggested during this period Jesus travelled to India and Persia where he learned something of India’s spiritual tradition before returning to Nazareth to begin his ministry. All three synoptic gospels say Jesus was baptised by John the Baptist, in the River Jordan. This symbolic baptism was the beginning of Jesus’ ministry. Following his baptism, Jesus spent 40 days in the desert where he was tempted by the Devil. However, he passed the test and refused any temptations of wealth or worldly gain. Jesus’s teachings were characterised by short, pithy statements that used striking imagery to capture the imagination of listeners. 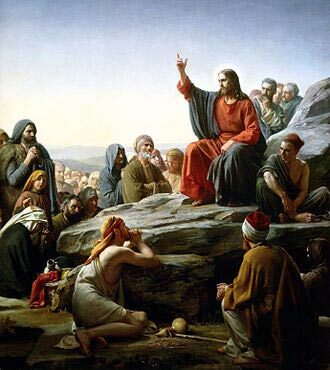 His most famous teachings are the sermon on the mount. Jesus Christ also taught that the Kingdom of Heaven was within. To attain this state he taught, it was important to be willing to give up attachment to the world and maintain humility and simplicity – to be like a child. 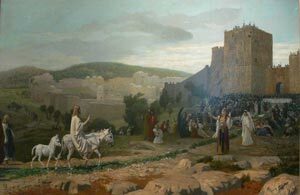 In the last months of his life, Jesus entered into Jerusalem and was greeted enthusiastically by crowds who shouted ‘Hosanna’. Jesus then entered the main temple and created controversy by overturning the tables of the money lenders. Jesus criticised them for conducting business in a sacred temple – claiming they had turned the temple into a ‘den of robbers.’ The radical nature of Jesus’ teachings, in addition to his growing following, aroused the concern of the religious authorities, who felt threatened by the message of Jesus. 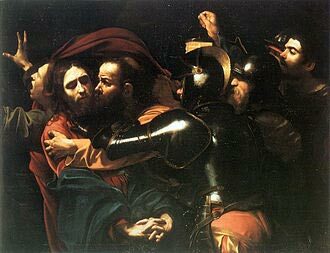 Caravaggio – the betrayal of Christ. Later that week Jesus celebrated the Passover meal with his thirteen disciples. He foretold that he would be betrayed by one of his own disciples and turned over to the authorities. As Jesus had foretold, this occurred. Judas betrayed Jesus to the temple authorities by kissing Jesus. Judas was paid 30 silver coins for his betrayal. But, he later repented of his action and hung himself from a tree. The Jewish elders asked him if he was the Son of God. Jesus replied ‘It is as you say.’ The Jewish authorities passed him to the Roman authorities with the recommendation he should be charged with blasphemy. It is said that Pontius Pilate was reluctant to have him executed as he didn’t see a crime that Jesus had committed against the Romans. Pilate’s wife had a dream he which she felt Jesus was innocent and his wife tried to persuade Pilate to release Jesus. Pilate ordered Jesus to be flogged in the hope this would appease the Jewish authorities. However, they still wanted to see Jesus executed. On the feast of Passover, it was traditional for the Roman authorities to release one prisoner. However, the crowd chose not Jesus to be released but Barabbas – a convicted criminal. Pilate washed his hands saying it was not his crime. 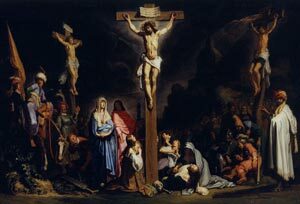 Jesus was then led up to the Calvary to be crucified. He was beaten and taunted by soldiers and some in the crowd. Many others were weeping at the sight of Jesus being taken to his execution. He had to carry a cross and at one stage fainted – and was helped by Simon of Cyrene. Jesus died on the cross, with a Roman soldier puncturing his side with a spear to prove that he was dead. The Gospels relate that on the Sunday following the crucifixion, Mary Magdalene visited the tomb of Jesus to find it empty. His disciples come to realise that Jesus has risen from the dead. Though disciples like Thomas doubted Jesus’ resurrection until he saw Jesus Christ in the flesh. 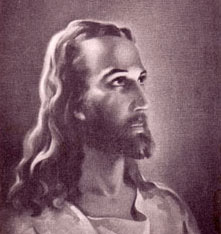 Due to a lack of accurate historical records, there is some dispute over the exact details of the life and teachings of Jesus Christ. The most widely used sources are the four canonical gospels – Matthew, Mark, Luke and John. It is estimated that these were written about 70-200 years after the death of Christ. There are also many other non-canonical gospels such as Thomas, Peter and Mary. Of particular interest was the discovery of the dead sea scrolls, which uncovered texts previously lost. 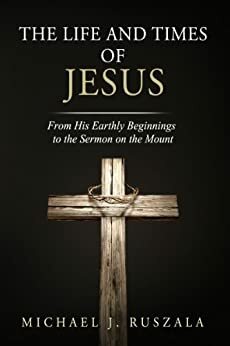 In the history of early Christianity, there was much debate about the nature of Jesus Christ. Some felt Jesus was a direct incarnation of God; others felt he was both divine and human. There were different branches of Christianity emphasising different aspects. For example, the Gnostics emphasised the immanence of God and the ability for followers to have a direct relationship with God. In 325 AD, the Nicene Creed formalised the Christian church teachings about Jesus. They accepted four Gospels as canonical and rejected many other gospels. The Nicene Creed also gave great emphasis to the writings and letters of St Paul. 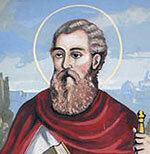 St Paul emphasised the divine nature of Jesus Christ and the importance of the crucifixion and resurrection. 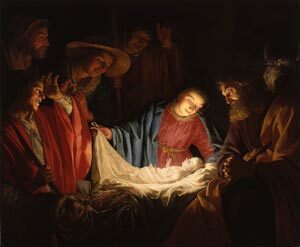 Many key figures in the Enlightenment/Renaissance felt Jesus to be a supreme teacher of moral and religious ideals, but rejected claims to divinity and miracles such as the virgin birth. For example, Thomas Jefferson wrote the ‘Life and Morals of Jesus Christ’ (known as the Jefferson Bible. Benjamin Franklin also looked to Jesus Christ as a great moral teacher, but, didn’t accept all the teachings of the Christian church. In the Hindu/Indian tradition, Jesus Christ is seen as a realised spiritual Master. A person who has achieved self-realisation or God-realisation. Jesus Christ is also looked upon as an Avatar – a realised soul with a special mission to save innumerable souls. Many Indian spiritual Master view Jesus Christ as divine – ‘an incarnation of God’ but they do not accept that Jesus Christ was alone in achieving this spiritual realisation. In Islamic tradition, Jesus Christ is seen as an important prophet of God. Citation: Pettinger, Tejvan. 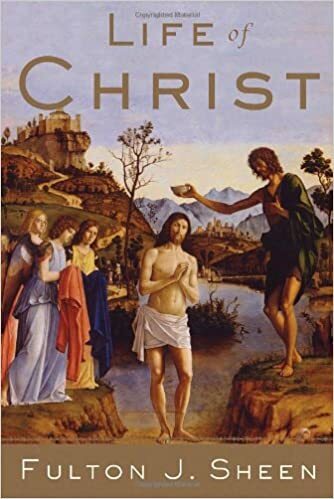 “Biography of Jesus Christ”, Oxford, UK – www.biographyonline.net. Published 19th May 2013. Updated 5th March 2018.